Ukulele by day … Riverfire by night. Last weekend of the holidays … the perfect family cultural experience … plenty to see and do … ENTRY to the festival precinct is FREE. Find out more by downloading our SPRUKE Family Fun flyer. Novice to virtuoso, bring the family, bring your friends — Uke ’n make music all weekend at SPRUKE 2017. Take your uke everywhere! 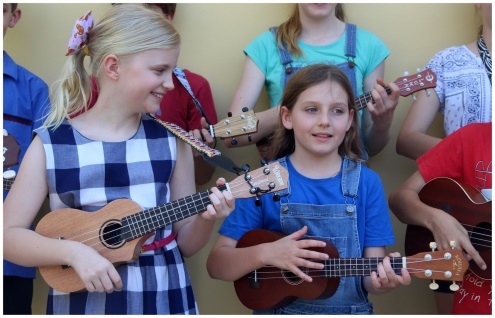 The festival is an immersion in playing ukulele, with quality entertainment and tuition thrown in. There’s lots of activities and performances that won’t cost a cent! You might not play a ukulele when you arrive, but you can by the time you leave! Head to the Beginners Ukulele Oasis for Beginners Bootcamp. Borrow a uke, learn your first chords, and play your first tune. Stick around for Novice Songs and learn a new song each half hour. Many performances include the opportunity to jam along. Saturday morning on the auditorium’s Kala Concert Stage begins with a free mass Ukestration workshop where the audience (beginners to veteran) learn a part to play in a giant ukulele orchestra. The Saturday morning Kala Stage fun is jam-packed with opportunities to play along. Each performing group will entertain for 15 minutes before leading a 30-minute jam. Join Miss Jodie on the Lanikai Bazaar Stage for the free Come Play Ukulele workshop to learn ukulele basics from an experienced music teacher.